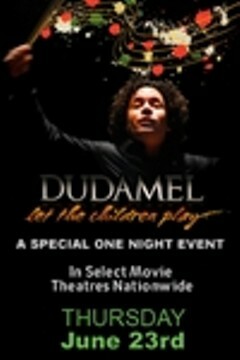 DUDAMEL: Let the Children Play - Premiere Event | Style Weekly - Richmond, VA local news, arts, and events. "DUDAMEL: Let the Children Play Premiere Event," is an inspirational evening showcasing music as a universal right and the role it can play in shaping a person's future. The program glimses the world of orchestras, conducting, and the importance of music as a hopeful path to face the educational crisis worldwide. Gustavo Dudamel, the gifted conductor, leads viewers through a journey of stories of the young people who are experiencing the joy of music in the most diverse and contrasting corners of the world. The two-hour event will also include "Crescendo - Why Music Is Life" -- a special 20-minnute story produced by CNN en Español that looks at the importance of music in children and explores the role of music in people's lives. DUDAMEL: Let the Children Play - Premiere Event is not showing in any theaters in the area.